I've been up since a little before 3, and I'm really starting to feel it now. We went through the normal weekend routine of milking and feeding everything before breakfast, and I've been back home for about an hour. I probably should have taken a nap, but that would have made too much sense. After all, sleep is overrated. 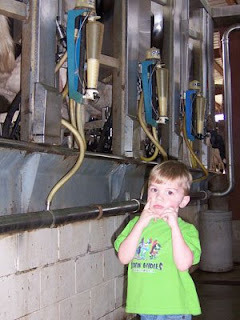 I'm currently uploading some pictures, like the one you see here of my boy, to Gilmer Dairy Farm's facebook page. If you're not already a "fan" of ours, I encourage you to become one today! I'll be going back over to the farm in about a half hour to help dad move the herd onto their grazing paddock for the morning. Afterwards, I foresee either yardwork or Sunday School teaching preperation in my immediate future. And you never can tell...a nap might just sneak up on me before the afternoon milking after all. Another year older...but another year wiser?